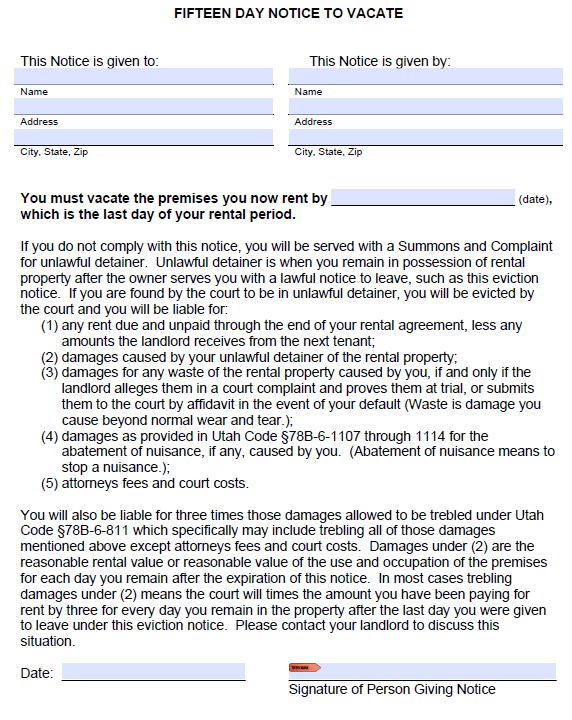 The Utah fifteen (15) day eviction notice is used to terminate a month-to-month tenancy. The notice informs the tenant that they have fifteen days to vacate the rental unit. If the tenant fails to vacate the rental unit by the date specified in the notice, the landlord can bring an eviction action against them in district court. The notice must be served personally, through certified mail, left at the rental unit (with a resident at least 18 years old), or posted on the premises of the unit (if the aforementioned options have been exhausted).